The following newspaper article written about "Joseph Pickett" (8) was in a newspaper dated February 3, 1945. Unsure of exactly what paper this article was in, however, I copied it word for word below from a copy of the Article, which I still have. The Newark Museum mentioned is in Newark, NJ. NOTE: This article leads you to believe that "Joseph Pickett" (8) is interred in New Hope, based on the last paragraph, however he is interred in Hulmeville, Pa.
New Hope boat builder and storekeeper, who achieved lasting fame as an artist, was responsible for an interesting sidelight at the recent exhibition of American Painting and Sculpture at the Newark Museum. His painting, "Washington Under the Council Tree" attracted wide attention. The painter, "Joseph Pickett", self taught, is believed to have painted only three original canvases, all of which have become well known. The Washington canvas is a product of this century, and is a picture of assembled objects. The tree was painted from memory since it was cut down in 1893 when it was 150 years old. It portrays Washington under the tree at Coryell's Ferry, now New Hope, while he was contemplating what to do on the eve of the battles of Trenton and Princeton. Though those battles were fought in the bitterest Winter with snow on the ground, Pickett's picture is a Summer landscape. A further inaccuracy shows the tree as it was shortly before being cut down, although it was only a young tree in Washington's time. How the Newark Museum acquired the painting is somewhat of a mystery-fairy tale. In 1930 Miss Katherine Coffey, the curator, on art and Holger Cahill, an authority, then on the museum staff, and Miss Elinor Robinson drove to Baltimore in search of art for a show for that year. They arrived here about 9 o'clock at night on their way home, and decided to try to locate an artist whose name, they had been informed, began with "R" and who had painted some large canvases' in which they might be interested. Every person listed under that letter in the telephone book was called without gleaning any information. Cahill then telephoned a painter he knew by the name of R. Sloan Bredin and was told that Bredin's brother-in-law, R. Moore Price, had the pictures. After following vague directions such as "turn left near the meeting house" and "drive in between two white posts" -- all in pitch darkness -- the trio arrived at the Price home and were well rewarded for their trouble. Not only did they get the picture of the tree, which the museum later purchased, but they were lent "Coryell's Ferry, Washington Taking Views," which the Whitney Museum now owns. They did not see the third Pickett canvas, "Manchester Valley," now owned by the Museum of Modern Art, that night because it was in the New Hope school. Cahill later went through several cemeteries in New Hope and vicinity searching every tombstone in each before he was able to find out that the artist was born in New Hope in 1848 and died in 1918. NOTE: "Asa Pickett" (51) notes in this article that there were "Five Pickett Brothers" when in fact there were "only" four. "Asa", who was my Granduncle and someone that I had previously talked with on a number of occassions, was a self proclaimed authority on the Pickett Family when in fact "I've since discovered that he knew much less than he thought." Many other family members, who like myself, have talked with "Asa" felt the same way. "Asa" notes "Sam" (10) as a brother which would have made "Sam" (10) his Granduncle when in reality "Sam" (10) was the son of "William P." (3) and the nephew of "Joseph" (8 - The Painter) and the 1st cousin once removed of "Asa". Since there was only 6 years difference in the age of "Sam" (10) and "Joseph" (8) it must have appeared to "Asa" that they were brothers. The author of the below story notes a "Five-Roman-Arch Concrete Bridge" in Hulmeville which is no longer there as of 1998. In its place is a flat modern span. Also, "The Old-Fashioned Clapboarded Toolhouse" and "The Bronze Marker" mentioned are also no longer there. There is also mentioned in the story a "Mrs. Carrie Pickett Ely" which will all my searches has not turned up in the family tree anywhere. "Joseph Pickett", the self-taught artist and noninheritor of art traditions, whose work once was shown in the Town Hall by the New Group, was born in New Hope in 1848 -- day and month unknown -- and died there on 12 December 1918. He had aspired to recount in paintings the history of his home town. Very few, however, of the pictures survive, and little is known of the painter's personal story. His "Washington Under the Council Tree" hangs now in the Newark Museum; his "Manchester Valley" in the museum of Modern Art. A third canvas belongs to the Whitney Museum. Not a single painting remains in New Hope nor, apparently, any pictorial record of the painter. What had he looked like, I wondered. I would like to know. Quietly, and under a nom de guerre, I advertised for photographs of him. Unlike Tom Knaly's, my advertisement brought no response, and yet, as I later discovered, it had not gone unnoticed. When I went to see "Asa Pickett", grand-nephew of the man of genius, who also lived on Mechanic Street, a few doors below where his granduncle had lived, tended store and painted, and asked if, perchance, he had a picture of "Joseph Pickett", I found he had given thought to the subject. "I was reading this town paper the other day," Asa Pickett replied, "and I saw another fellow was looking for pictures of "Joe Pickett". Well, I could show you a picture of my grandfather, "John Pickett", and if I were to tell you it was a picture of "Uncle Joe", how the hell would you know the difference or this fellow that's advertising, either? You just by God wouldn't know if it was "John" or "Joe" or anybody else because you don't know a damn thing about the "Picketts" and there's not many in this whole town who do. And still this fellow advertised and says he'll pay for a picture and he can't even tell if it's what he wants or not. Now what kind of sense is that?" I was in no position to say and I guess "Asa Pickett" saw that he had me. He gave me a withering look. "You don't know," he said, answering his question, "because you're just like all these other people going around talking about "Joe Pickett" and don't know a goddam thing about him, but there were five brothers, "Joe, Sam, Bill, Jake and John", and they all looked much alike. Uncle "Joe" was, I'd say, about five foot eight; weighed maybe 195. All the "Picketts" were heavy set and long livers, what you'd call well put together. If you want to write a book, or are trying to make money out of "Joe Pickett", then this is as much as you'll get from me. I've had people come out from New York trying to find out about "Uncle Joe"." I said to "Asa Pickett" that I had no intention of writing a book about his famous relation, but only some words, and that I would do so in any case, for "Joseph Pickett" had painted himself everlastingly into the area. As for making money, I said that in years at my trade I had earned no more than wages. "I am not complaining," I told him, "just stating a fact. If a few paragraphs and pages on "Joseph Pickett" are going to mend that situation, I will indeed be surprised, but not unpleasantly so." My condition seemed to suit "Asa Pickett". "A few paragraphs -- I don't mind," he said in an amicable tone. "I could have had all the paintings," he went on to say, "because "Uncle Joe" had no children. Now I wish I had them, but how was I to know? There just was no way. "Joe Pickett" never said he was going to be famous, and I don't believe he ever thought a damn thing about it." I asked the nephew about the paintings. What subjects had interested the uncle? "Of the big paintings I remember the ‘Schoolhouse,'" "Asa Pickett" mused, "and 'Ringing Rocks,' and 'George Washington,' and 'Manchester Valley' -- that's what they used to call it out Mechanic Street. I don't know how many little paintings he did, dozens of them, about the size of a nine-by-twelve light. There was a very nice one of the American flag. But I guess his widow, that was my "Aunt Emmy", burned them. You can't blame her -- they were just lying around and nobody wanted them. "Three of us grandnephews are alive," "Asa Pickett" continued, "but I knew Uncle the best. I worked with him when he had his store in the building that Bill Ney owns now. He used the whole thing; it was his house and he had a store in the house. You could buy anything from a pin to a pail of paint." "He was a canalboat builder by trade, a good carpenter, and most of the time he worked at the boat yard where the Legion hall is now, but he was always dickering about something and always trying something new. At one time he lived over on Bridge Street..."
"He must have been about sixty when he started painting. He had to mix his own paint out of what he kept in the store and he sold heavy muslin and that's what he painted on. He didn't make any fuss about it -- never went out to paint anything. He just sat in the house and painted when he felt like it. Some of the people laughed at the pictures; others thought they were nice." "Asa Pickett" then showed me a picture of "John Pickett", "Joseph's" brother, and "John" looked good to me. It is hard to imagine how "Joe" could have looked any better. "Asa" said, "There are not two men on Mechanic Street now who could tell you if it was "John" or "Joe"." He showed me another photo of "Grandfather John" sitting on the porch of his house, trolley tracks, long since removed, going by the door, and in place of the concrete bridge in front of the Playhouse a wooden canal bridge -- in fact a whole albumful of family pictures, and "Joe", so he said, in none of them. "I was born across the street in Brick Hall, lived around this corner all my life. And," the aging nephew said, closing the album, "some people think they know about New Hope." A man can be well informed about New Hope yet know but little of "Joseph Pickett", and be able to document even less. The Doylestown 'Daily Intelligencer', 20 December 1918, under the heading "Necrology," described "Pickett" not as a painter, of course, but "for a considerable time a merchant on Bridge Street." It also informed its uncounted readers that though the funeral was held in New Hope "interment was made at Hulmeville Cemetery." Hulmeville, on the east bank of the Neshaminy Creek, lies in Middletown Township, eighteen or twenty miles southwest of New Hope and deep in the southwest corner of lower Bucks. Lower is different from central Bucks; it looks more like southern New Jersey, or the low coastal plain of Maryland's eastern shore. In colonial times and for many years after, Hulmeville was a center of the woolen and weaving industry. Today, however, only an ancient string and rope factory remains to tell of its manufacturing past, and tie up loose ends of history. And though the stacks of the Fairless Works, United States Steel, make their skyward thrust but ten miles away, the population of Hulmeville is scarcely one thousand persons. The first wave of progress passed over it early. For the time being Hulmeville appears to be out of the running. No research department, no new products division. On a drizzling, cool and low-pressure day when damp leaves were falling, I seized the freedom of the steering wheel and drove down the Durham Road, down beyond U.S. Route 1, and into the borough of Hulmeville. There I learned from the man in the Unity Frankford store that the cemetery lay on the other side of the creek, on the Neshaminy's steeply rising west bank. So, crossing by the five-Roman-arch concrete bridge, I rode over, and on up the hill and into the cemetery. Declining toward the Neshaminy, it appeared not at all an unpleasant place to lie down in. The graves did not look uncomfortable, especially those uncrowded by excess stone. Near the graveyard entrance stood an old-fashioned, clapboarded toolhouse large enough for a plantation office. As I approached its open door, the combination gatekeeper, gravedigger and superintendent of grounds, one Arthur Owen -- for I asked him his name -- came out. Of medium height, brown-eyed as the earth, brown eathery-faced, lean and becapped, he looked for all the world like a Scottish crofter met in a Scottish and afternoon mist. I asked Mr. Owen where I might find "Joseph Pickett". "Pickett", he said in a high, whinnying voice. He shook his head. "Do you have a plan or map of the cemetery?" I asked. "No," he replied in the same equine tone, and again shook his head. But he did look thoughtful, and invited me to come into the toolhouse and out of the rain. Inside the toolhouse smelled fine, and felt warm and dry. A potbelly stove stood in the center of the single large room and a coal fine burned in the stove, just a small banked fire with the stove door open, and the toolhouse door open too, for the day was not cold but only damp. The first fire of autumn for me, it felt good. I warmed my hands, for cemetery trotting is, after all, cold work. On top of the stove, Mr. Owen had water heating but I cannot say whether for shaving or making tea. I gave him a cigar, a rum-cured crook, which he lighted at once and with amazing rapidity shortened by two or three inches. It did not seem to help. "Pickett, Pickett" he muttered. He said he could not recall seeing the name. So out and into the drizzle again. I walked up and down several marble - and granite - bound lanes, looking to right and left. This was no little boneyard; the search began to stretch away, long and wet. I returned to the warmth of the toolhouse and gave Mr. Owen another cigar. He lighted it promptly and bellowed at it. "Pickett"," he repeated, "Pickett", No." I went out again, came back again, and presented a third cigar. "Write that name down," Mr. Owen said and handed me paper and pencil. I took them, and as I printed each letter I spoke it. Settling the third cigar in his face, Mr. Owen listened. His expression changed; I think he smiled just a little. "Come with me," he said. We went out together, walked down the easy slope to a point where the ground breaks steeply above the creek. There on the aisle, so to speak, for the headstone faces the southern and wooded boundary, stood the rather imposing and businesslike stone, and engraved across the top of the hefty granite the single word, "PICKETT". Altogether a very suitable stone for the "merchant," as the papers had described him, and for the artist who had painted simply the seven letters of "Pickett" on the front of his general store. Beneath that foursquare and significant word, the stonecutter carved the given name, "Joseph", and dates, 1848-1918; and below that, "Emily M.", and her dates, 1848-1929. And that is all. At the foot of the stone a little bronze marker states, Perpetual Care. "Perpetual is a lot of care, Mr. Owen," I said. "It is that," he replied. For a fraction of all that endless time we stood in the rain, just looking, and one of us feeling his feet getting wet. Then, handing over the last cigars in the five-pack, I bid Arthur Owen good afternoon. "Joseph Pickett" had been forty-five or so when he married "Emily M". The fact that she had been the same age may account for the lack of children. "Emily" had come from the lower part of the county. She probably met her future husband when, in the 1890's, he conducted a shooting gallery at Neshaminy Falls Grove, then a well-known amusement park in an idyllic setting on the creek not many miles above Hulmeville. In his earlier years, "Joseph Pickett" had often held concessions at fairs and parks but after his marriage he led a more stay-at-home life. However, as both the Mechanic Street and the later Bridge Street stores stood beside the canal, on the towpath side, he still had some traffic with the outside world. When quiet times came, as they inevitable did, he went to a room at the back and painted. "Jos. Pickett", Art., he signed himself on the canvas. A native son, Bramwell Linn, told me that he remembered "Joe Pickett" painting but recalled more clearly stealing the store-keeper's pies. As a small boy Bramwell Linn liked to visit the Bridge Street store where the pies were displayed, buy one and filch one. A grandniece, "Mrs. Carrie Pickett Ely", told me she could have succeeded to all the paintings. After her granduncle died, her grandaunt asked her to store them. But alas, they had not seemed worth storing. " "Aunt Emmy", as we always called her, was stout," "Mrs. Ely" reminisced. "So was he. She was a very likable woman, and he was a nice pleasant man." Not until 1925, seven years after his death, did a painterly taste encounter Joe Pickett's paintings. In that year Lloyd Ney, pronounced 'nigh', a young upstate painter who had studied in Paris, moved into New Hope. Soon thereafter, in the then Worthington Brothers garage and automobile showroom on Main Street, Bill, as Lloyd has been called many years, saw a couple of canvases standing against a wall. The work of an obviously untutored and, outside of New Hope, certainly unknown hand, one was titled "Washington Under the Council Tree," and other, "Coryell's Ferry 1776." Bill Ney liked them. At the Logan Inn a day or two later, chatting with the then proprietor, old Pop Johnson, Bill said he wanted to buy them and was willing to pay $50. Pop Johnson replied that Bill must be crazy. Seven years earlier, at the two-day auction of the former storekeeper's stock and effects, the paintings had gone for one dollar each, or less -- and most of them to the widow. However, if Bill really wanted the pictures, he better let Pop Johnson handle it. Pop Johnson bought them for $7.50 and sold them to Bill for $15. Bill Ney, now the owner of two large "Picketts", took them to his studio where, admired, they hung; but not for long. A few months later, being in need of frames, Bill surrendered the pair to R. Moore Price, a local dealer in paintings and frames for $50 worth of the latter. Moore Price, the new possessor of the Picketts, consulted his brother, Fred, in those days the owner of the Ferargil Gallery in New York. Fred Price allowed, according to Moore, that Moore might get a couple of hundred apiece for the work of the New Hope primitive but that if he, Fred, were to show them on Fifty-seventh Street, his customers would mob him. Time passed. Moore did not sell until 1931. Some thirty years later he told me that as nearly as he could recollect he got $500 for one, and $700 for the other. "We hated to part with them," he said, speaking for his wife as well as himself. "There was something so damn human about them." Nowadays a Pickett is not often seen in New Hope. So far as I know the last time was when the remodeled Parry Barn was opened as a cultural center in June, 1960. For that occasion the Whitney Museum loaned the New Hope Historical Society its "Coryell's Ferry 1776." Throughout the exhibition period the painting was guarded by the uniformed local constabulary, and of course the Society paid the insurance premium. Valuation: $30,000. It is hard now to buy or steal the ex-storekeeper's wares. About all you can do is borrow. Two nights of frost and Indian Summer and Gilding and Bronzing Leaves. Along the towpath, dogwood is purple, sumac has changed into scarlet. A maple showing both red and green foliage looks benevolent and relaxed. See, by the roadside, the fuzzy and coral grasses, tender-blushing and Renoir pink. In this blue smokey time of year, Indians break up camp. They turn toward cold-weather hunting grounds even while tourists are getting their second wind. October 9, fair and mild. At the post-office matins Mrs. Davis announces she likes it, the day this is. "This is Fire Prevention Week," she informs me. "I have a feeling the Reds are going to win today," says Robert Johnson, looking deep as the freezer he sits beside. "Robert," I say, "on a day like this, how can you miss ?" Robert replies, "How about that ?" and beams. Corn leaves have turned. Cornfields are looking untenanted now, like birds' nests after the birds have departed. On the last old-style farms the sheaves stand in shocks. Born in New Hope, Pennsylvania, Pickett's early life was spent as a carpenter, learning the trade from his father. After his marriage his interest began to focus on painting. A painting sent by Pickett to the annual exhibition in 1918 at the Pennsylvania Academy of Fine Arts received three jury votes, including that of Robert Henri. Only four paintings by Pickett are known to survive and it was only in the 1930's that his work really began to receive general recognition. One of the salient features of folk art is its timeless quality; the work of the early nineteenth century is often close to that of an artist a hundred years later. An example of this is the painting "Manchester Valley" by "Joseph Pickett" (1848-1918) which, until the life of the artist was researched, was exhibited as dating from the early nineteenth century. It was actually painted during the period of the First World War between 1914 & 1918. Trained as a carpenter under his father, who had moved to New Hope, Pennsylvania, in 1840 to work on the canal locks, Pickett made his living from carpentry and from a country store selling groceries and general goods, starting to paint in his spare time at around the age of 42. Like Hicks, Pickett never really considered his painting as anything but a pastime and it was not until the last year of his life that he sent a painting to the annual exhibition at the Pennsylvania Academy of Fine Art - where he received three votes, including that of Robert Henri. It was only in the 1930s, when his work was included in the large exhibition of folk art at the Museum of Modern Art, New York, and the Newark Museum, that his painting was truly recognized. The technique that he used in his painting was unique in its mixing of sand with house paints to build up low relief textured surfaces, and he later progressed to using artists' oil paints in the same way. 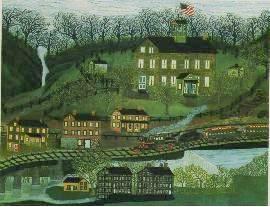 The painting "Manchester Valley" was executed to commemorate the coming of the railroad to New Hope and reflects the changing landscape of America brought about by industry and the new form of transport. It displays much that is typical of folk art, including the artist's attitude of seeing things conceptually rather than according to a logical linear perspective. 45 1/2" x 60 5/8"
Where Hicks earned much of his living from painting furniture, houses, signboards and rich farmers, "Joseph Pickett" was a genuine amateur, a true Sunday painter. Like many folk artists, "Pickett" shows an unnerving ability to make a telling choice of subject matter and to bring his paintings to life with a great intensity of vision. The following was taken from a book authored by Adi-Kent Thomas Jeffrey, published by Hampton Publishing Co., Southampton, PA in 1971. Many a renown artist has lived in New Hope, Bucks County's famous art colony and summer theater resort. But none has done the quaint and colorful town more proud, as the saying goes, than "Joseph Pickett", the great primitive artist whose immortal "Manchester Valley" hangs in the Museum of Modern Art in New York City. "Pickett" in his day, the late years of the last century and the early years of this, was the village grocer and butcher. He lived and ran his shop in a little brick house just off the canal on Mechanic Street. Some residents in the town still recall seeing his well-built figure hunched over some paintings he was working on in between store hours. One of those paintings, few people realize, was drawn directly on the front brick wall of the building. There it still exists to this day under some thirty coats of paint unknown to the passer-by. Oh, "Joseph Pickett" died in 1918 if you consult the encyclopedias but if you ask some of the many residents who have lived in that house since he was owner, you will learn quick enough that the unique "Mr. Pickett" still likes to hang around. Unrecognized in his life time, he most certainly is making up for lost acknowledgment in his "after-life." He seems to be bumping into or having good sport with scores of visitors in his old house. Take Michael Majofski, for first instance. Mike lived in the "Pickett House" in the mid 1940's. He still vividly recalls being disturbed almost nightly by the pounding of heavy feet up a flight of steps on the side of the house. The noise itself was nerve-wracking enough but add to that the knowledge that the stairs no longer existed and you've really got the shakes, say Mike. In the late 1940's the James Hoffmans moved in. In addition to James and his wife, Betty, there were two children, a three-year-old son and a baby girl. An incident occurred in that house to Mrs. Hoffman that she has never forgotten to this day. Betty was working in an upstairs bedroom when she heard a sound of someone moving around in the master bedroom where the baby was asleep in a crib. She stopped what she was doing thoughtfully. What could that noise be? There was no one home but herself and the two children. Her son who was with her ran into the other room and called out, "A man is in here, Mommy!" Betty Hoffman dashed into the room her breath tight in her throat. There sitting on her bed was a man. He wore dark trousers and a deep-toned shirt open at the neck. His hair was iron grey and he had a grey moustache. He said nothing but simply looked calmly up into Betty's eyes. She spun on her heels and reached for the baby, snatching it quickly up into her arms as she made a grab for her son almost simultaneously. But in that second instant when she looked back at the bed, the man was gone. With tense fingers she quickly put through a call to a neighbor. The friend hurried over and together the two went through every room. "I know an intruder was in here. Where did he go? How could he have gotten in?," were all the thoughts racing through Betty Hoffman's mind. But nothing could be found. Not a sign of a person or a disturbance. Finally the two women searched the outside where deep snow had packed an unbroken white covering all around the approach to the house. There were no footsteps but those of the neighbor's. "Eventually it dawned on me," says Betty Hoffman today, "I had seen "Joseph Pickett"!" Not many years after that the Hoffmans moved away, I spoke to the house's newest residents. "Everything happens here," one of them told me. "At night we hear padded footfalls in the front room upstairs; or shutters banging even when there isn't a breeze stirring. Other times we've felt cool air flow past us like air stirring from someone's passing. We've found writing in chalk on the walls. Nothing makes sense -- just a hodge-podge of letters. On the other occasions we've heard loud knocking on the back door. Always in the middle of the night. When I go down and open it, no one is ever there." The other resident nodded her head and added, "Then thee are the times I go down into the cellar for some canned goods or jarred foods. Many times a bottle of ketsup or a jar of cherries or olives will come flying directly at me off the shelf before I'm near enough to touch anything. We've also noticed the door to the artist's bedroom will not stay open. No matter how many times we open it, before long has passed we'll hear a loud bang as it slams shut. "Joseph" simply wants to keep his door closed!" Apparently "Joseph" still wants to do a lot of things. The present owners of the house, Howard and Linda Uible, who run the restaurant, "Number 8" across from the "Pickett House" on Mechanic Street, can tell you they've heard many things from the shop keepers there. I found this to be true. The last two proprietors I spoke to on the canal side have heard footsteps on the inside stairs of the place when no one but themselves were present. And as for the owner of the "Cheshire Cat" and his assistant -- well the stories of "Joseph's" mischief are manifold. For example, Thomas Lynch will tell you, he leaves a bowl on a shelf in one room and finds it gone a few hours later. Then it will reappear the next day. On similar exasperating fashion other items in his shop move about or change places or vanish completely. On another occasion he came in one morning to find the mortar between the old bricks of one inside wall fallen all over the floor on that side of the store as though someone had scraped loose the cement dust deliberately with his fingernails. It was a near-endless job to clean up the particles as well as get the gift items free of the grey-white coating. One day, both Mr. Lynch and his assistant can tell you, a woman came into the shop to look around. When she got into the back room close to the area where the old stairs and entrance door had existed in "Pickett's" day, she felt a frightening icy feeling come over her. She fought off a shudder and went on around the store. As soon as she returned to that spot again, she felt a terrible sense of horror and revulsion. "Some one or some thing doesn't want me back there," she told the shopkeepers and hurried out. She's never been back. Mr. Blackburn next door can tell you, also, of hearing footsteps on the stairs and bangings on the doors. Recently I spoke with a woman who had resided in the "Pickett House" in the early 1960's. Had she experienced anything untoward there? Her answer was to the point. "Why that old so-and-so used to lock the bathroom door on me! From the inside! So I couldn't get in! He'd push over that slip-lock bolt and the only way I could ever get it open was to send for the police!" With such a wealth of mischief filling the old house by the canal, it's a wonder the historic "Manchester Valley" stays in place on the walls of the Museum of Modern Art in New York City! Maybe it doesn't. I'll have to ask about that someday.